As clinicians we are obligated to diagnose and present clinical findings to our patients that address decay, disease, degeneration, function; pathology of all kinds. It’s our job to present a path of treatment and therapy to prevent, cure, or treat the issues that we encounter. However, oftentimes the options we give our patients don’t meet their current life circumstances, budget, or timing. The following case is an example of a patient who was treatment planned for a full mouth rehabilitation to address her pathology. Her life circumstances prevented her from pursuing all of her treatment to completion. We modified her plan to not only address her most immediate concerns, but to present a long term consideration that fit with her goals. 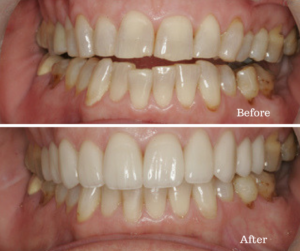 The patient wanted to address the poor aesthetics of her case while preventing further wear. I treatment planned to stage her rehabilitation to initially increase vertical dimension slightly off of the maxillary 10 units. I prepped #25 for a facial composite to immediately remove the interference with its position. I reshaped tooth #20 and #30 to take them out of occlusion and remove the posterior interferences as well. 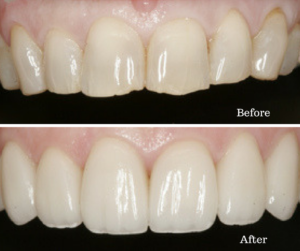 We will complete the molars over the next few years to maximize insurance and establish function by finalizing the occlusal scheme. Teeth were prepared for fabrication of veneers and crowns on #4-13. Material chosen was I.P.S. Empress by Gold Dust Dental Lab. Composite veneer on tooth #25 was fabricated utilizing Empress composite. Tears of joy from a patient are always a welcome response at a final result as beautiful as this! How do you treatment plan complicated cases while maintaining or improving function? We’d love to hear from you in the comments! And don’t miss the last case of the month, read it here.